Nye Russell-Thompson, also known as StammerMouth, took his very first solo show to the Edinburgh Fringe Festival in 2015, where he was shortlisted for a Total Theatre Award. Unlimited offered a small touring grant for Nye to take the work around the country, and has been in touch with him ever since as one of our Unlimited Alumni Artists. A few years after the initial tour, we thought we’d catch up with Nye and ask him how everything’s going, and see what the impact of our grant has had to his developing practice. Did Unlimited’s support open new opportunities for you as an artist? Thanks to a funding grant from Unlimited aimed at emerging artists, I was able to tour with a paid technician and producer. This, as any eager theatre makers will know, is essential for getting your show seen by a variety of people – not just the same group of friends and family and a few stragglers! At the time (2015-2016) the tour of my show ‘Just A Few Words’ took me to Brighton, Isle of Wight, and a British Stammering Association open day in London. I then went on to perform the show at two career-changing venues: the Lyric Theatre in Belfast for the Bounce! Disability Arts Festival, and Southbank Centre’s Unlimited Festival in London. Unlimited’s support enabled me to have British Sign Language interpretation at these bigger venues, as well as speech-to-text at Southbank Centre. The opportunity to make my work more accessible to deaf audiences meant I could raise awareness of stammering to people who may not be able to hear a stammer. What is it like being an Unlimited Alumni Artist? In addition to previous financial support, Unlimited are in frequent contact with me, flagging up professional development opportunities all across the country. Recently, they stepped in to provide travel reimbursement for a return journey to Newcastle for a performance of ‘Just A Few Words’ at Alphabetti Theatre. They are a constant help, which I am incredibly grateful for! Being an Unlimited Artist means a lot to me, as their help is what enabled me to continue to develop my brand StammerMouth. It is just lovely to be part of a wave of fully supported disability arts network, and feels spectacular. It has enhanced my confidence, because having a partner and supporter is vital when bringing somewhat vulnerable work to new people. It feels like they have my back! You’ve just moved to Cardiff and presented ‘Just a Few Words’ at the Cardiff Fringe early June – what’s it like relocating to Wales? It’s a fantastic city! The theatre particularly is varied and exciting, in the mainstream and in the disability theatre world with Hijinks at the Wales Millennium Centre (WMC) being a bridge between these two. There is always something interesting on at the WMC, and it’s thrilling to encounter festivals I had no idea existed like Festival of Voice bringing shows in about the variations of language and culture, disabled artists, dance, workshops, everything I find exciting! On the flip side, I am friends with a huge group of artists in Cardiff, many of whom have been running Cardiff Fringe Theatre Festival for the past few years with increasing success and sponsorship from big companies. 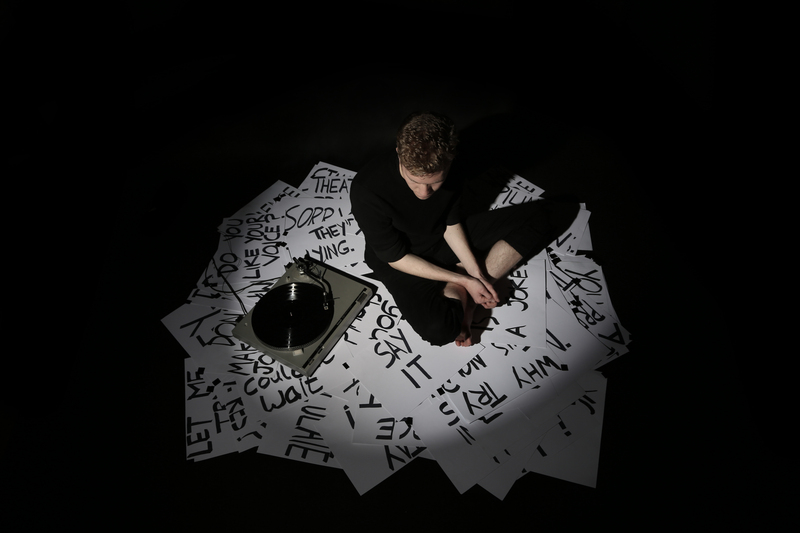 Doing the Cardiff Fringe was wonderful, and I won the TicketSource Festival Favourite Award for “encapsulating what the Cardiff Fringe is all about”– which was so great to raise awareness of stammering to a new audience. From here, I aim to take ‘Just A Few Words’ to local venues like Chapter Arts and Sherman Theatre, and I’m seeking new working relationships with local artists and producers. So so so excited! What else have you got in the pipe-line? Next up for StammerMouth is an exploration of a pretty uncomfortable subject, relating to OCD and anxiety. I do like to pick the difficult subjects to talk about! The aim is to make another accessible, fun and truthful piece of theatre. Unlimited has expressed intrigue in this new project, so… we’ll be talking! Thanks Nye, let’s certainly talk – and you can apply to the next round of Unlimited funding which is open to artists based in Wales. Details will be online on our website on 13th September.